In this fast paced physical devised piece Utopia Theatre invite you to reflect on who we were, what we have become and where we are going... Over 8 million people share our city - a blur of lives we'll never know. We rush past each other on the street, queue together in the supermarket and sit side by side on the tube. We may never have exchanged a word before, but now we are all here, waiting to tell you our stories. 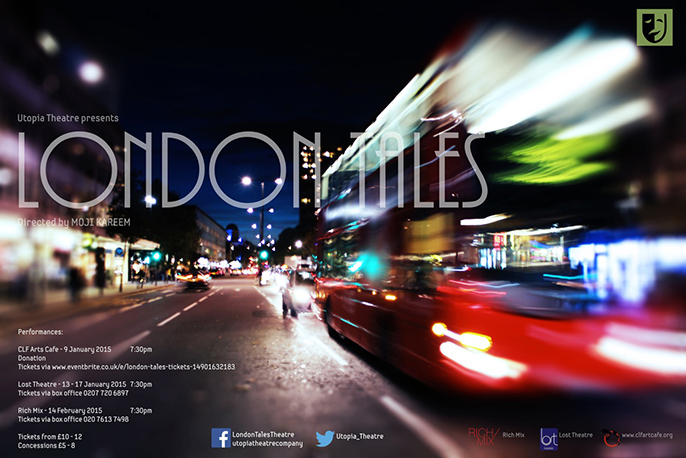 London Tales invite you to encounter real-life stories told by the people who lived them. Each story, from the moving to the bizarre or comical. A series of inextricably linked stories, is an image of London as a city of solitude and fantasy; even when people connect, it is in bizarre, unexpected ways. The dialogues somehow remind the audience about their history. It questions the present and may invoke the need for an urgent dialogue about the future.